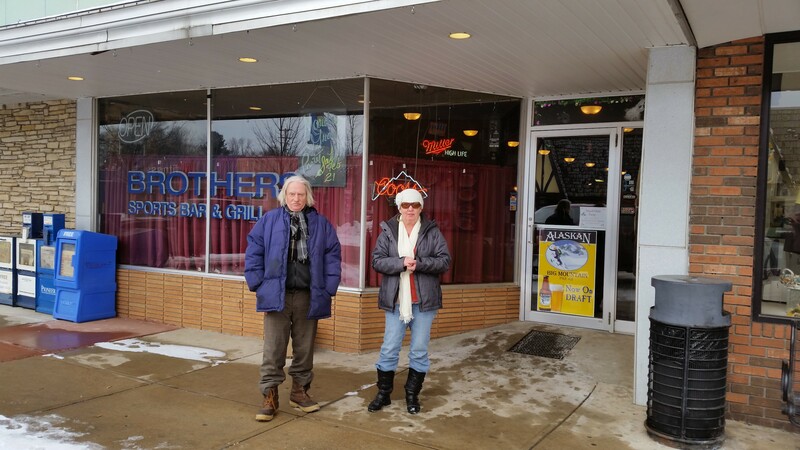 Lowell, MI- I’ve never seen a more varied reaction to the happenings in Washington D.C. than this week following the presidential inauguration of Mr. Donald Trump on Jan. 20. Any psychology student would have had a great doctoral thesis if he or she had analyzed and tabulated the responses to president Trump’s inauguration, Women’s March on Jan. 21, the first executive orders, retreat in Philadelphia, the Right to Life March and the mainstream media commentaries. Not to speak of late night shows, Saturday Night Live, and the fashion comparisons of the First Lady to historical figures and her linguistic disabilities. Only the death of the incarnate of the modern woman Mary Tyler Moore, and maybe watching “Charlie Bartlett” kept the weights of humanity from tipping over completely. “So tell me what you think about all of the above and I’ll tell you who you are,” independent analysts and charlatans tested the Internet waters. Facebook, twitter and other social media were bubbling like a witch’s potion with all the ingredients starting with hate to complete apathy, withdrawal and secure rationalization. In between reigned ridicule, sarcasm, vulgarity, hopelessness, fear and despair. Of course, there were observers patiently waiting to render their opinions after all others have gone first, ala “risqué” style. I’ve tasted my share of firsts with the post “Join 10 Actions in 100 Days”, a story about a local inspiring woman Sharon Ellison, a participant in the Women’s March. The overwhelming reaction was that the women were vulgar and inappropriate like Madonna in order to get attention. I didn’t catch what an editor would have caught, that is a vulgar phrase on a sign accompanying the post. It cost me some. However, one of the best observations in the last 8 days was the use of the “alternate fact” term as the means to justifying anything. I find that term especially useful in teaching my American born protégé Josephine Marie Palova, 3, the Czech language. Not, that this is anything new in politics. “What you meant to ask me, was…. ?” A city manager restructured my question to his prepared answer. “But you said something else,” I said. The politician’s word play is like a bad game of chess. No matter how good you are, the opposing party will claim they had won…….although in a different game. Well, at least the Wall Street was happy in this game as the stocks soared past the 20,000 mark, if that is any indication of anything, according to ill-willed analysts. I found some reprieve in the pacifist stance on the matter of the affairs in the union, in the world and in the universe, thanks to a post from a friend in Iowa, Sheryl Groen. There’s means to an end, my friend. Be kind, everyone else is fighting a hard battle. Love like a kid, because love wins. Featured photo thanks to Michelle Emaus of Lowell. Copyright © 2017. Emma Blogs, LLC. All rights reserved. This article is about a woman whom I have known for a long time. Her name is Gail Lowe. Lowe is a retired nurse, who has hiked the Appalachian Trail twice and most recently the North Country Trail in memory of her daughter Becka. Lowe’s only fear remains that she won’t be able to hike anymore because of aging. Becka’s fear before she passed from breast cancer was not to be forgotten. 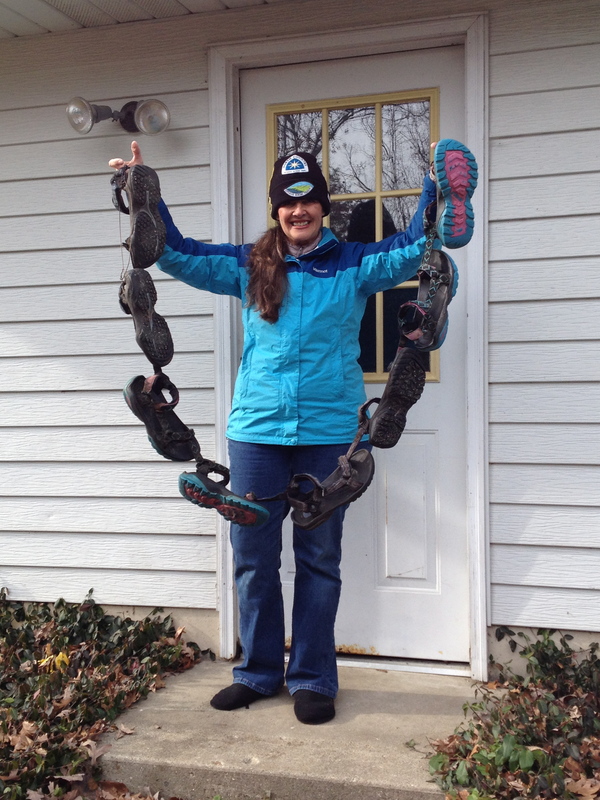 So, her mother immortalized her with the 4,600-mile long hike through seven Midwest states. She got sick on the trail and turned 65. There is a saying that you cannot step twice into the same river, meaning that everything flows with time. Well, I have. First, in the late eighties when I took care of my grandparents until their death. Then, I left Czech Republic for the USA. Brother and sister in Reed City, a theme for a short story. Now, I am facing the same destiny with my brother who suffers from paranoid schizophrenia. He can and cannot take care of himself. He refuses to take medication and is very angry most of the time. I fear that I am not going to be able to handle him. The unknown ahead is so overwhelming that’s why I am writing about it to ease the burden. I will be stepping twice into the same river, only some 25 years later. Copyright © 2015 Emma Blogs, LLC. All rights reserved. The April newsletter is here. It’s been on my radar screen since I’ve established Emma Blogs, LLC. Every month, the newsletter will feature news from the blogs portfolio, blogging tips and editorial/marketing calendar. Features will include en excerpt from the story of the month and a featured blogger. You can submit who do you think should be featured and why, as well as a story,a poem or a photo with links to your blogs. You can also submit a story about your niche business with a link. Emma Blogs newsletter for April. The deadline for submission for the May newsletter is April 20. Happy blogging. Copyright (c) 2015 Emma Blogs, LLC. All rights reserved. Follow Emma Blogs LLC team as we roll into spring and summer for a magic time. Advertise and email emmapalova@yahoo.com for rates. The focus at ehealth will be on wellness, prevention and living a happy full life. The old-fashioned beauty of hydrangeas cannot be substituted. Coming soon is Emma Palova’s personal story about her cataract eye surgeries and bouncing back after almost complete blindness. I wrote about Dr.Verdier while freelancing for the Grand Rapids Magazine and Advance Newspapers about 10 years ago. At the time I did not expect I would be needing a surgery so soon. “Hello youngster,” greeted me Dr.Verdier during evaluation last month. “You’re the youngest person in here,” said the anesthesiologist later in the surgery room. “Yes, everything is relative in this world,” I said. Follow Emma’s Writings for insight and fun. Learn how to write, learn how to blog and design. Be your own journalist. Learn how to express your voice. Shout out loud. 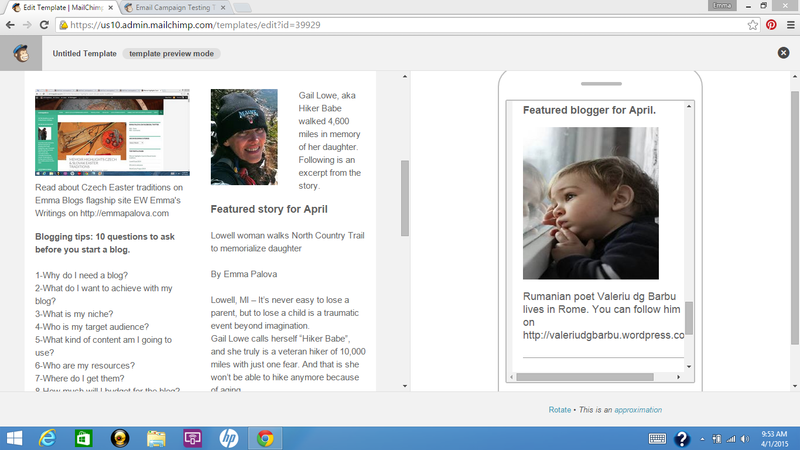 Advertise your work and brand on my rolling portfolio of spring blogs. I am starting a new screenwriting blog with focus on a screenplay that I have written in 2008-2009 when my husband Ludek was working in Wisconsin. Every day after work, I sat behind a PC computer, after working on a Mac at the office, and started spitting out words. “You’re bilingual,” said former Lowell Light & Power manager Tom referring to my two computers at work, side by side. But, I am also fully bilingual in English and Czech. 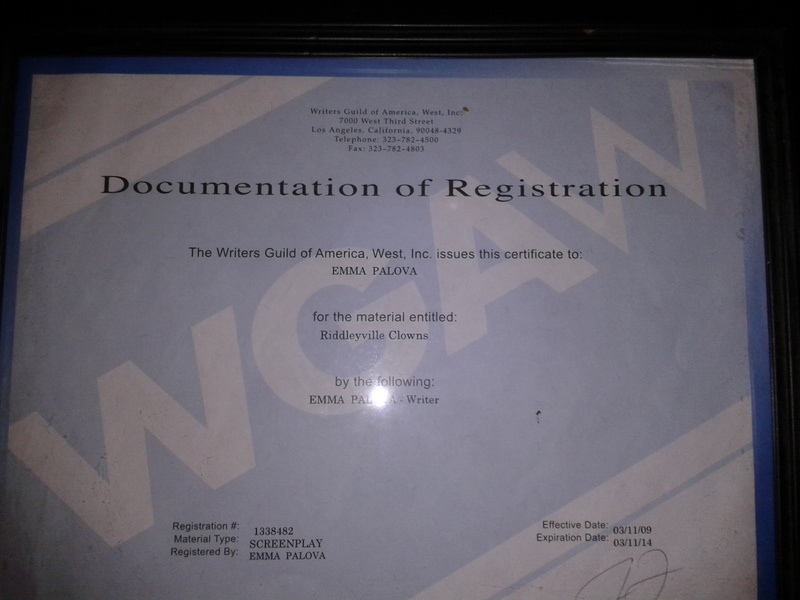 I wrote a screenplay “Riddleyville Clowns” in three months, and I registered it with Writer’s Guild of America, West WGAW. I have the certificate framed and displayed. “That in itself is a feat,” local businesswoman complimented me. I consider myself and my friends as keen entrepreneurs. During my recent visit to Europe, I encountered many of them. One entrepreneur Ales Kobylik owns an information firm TechnoDat in Zlin, another one owns York Café in Vizovice. “That’s named after the owner of the building Eda York,” said Petr Surovec, owner of the York Café. Some 20 years ago, I gave advise to my cousin cartoonist Olin Pink to start a graphic firm. He learned the design program and established the successful Grafik firm located in Stipa. Most recently, I told my sister-in-law Jarmila to start a baking business CJ Aunt Jarmilka’s Cukrovi. 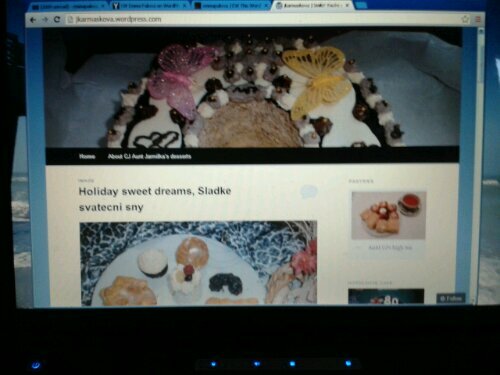 I designed her blog. She is a successful baker who also lives in Stipa. When the Parnell store was for sale, I was ready to buy it, but somebody beat me to it. Last year, I started writing my memoir “Greenwich Meridian where East meets West.” I designed the blog EW Emma’s Writings on WordPress to support its publication. Now, I am caught in a web of words, SEO and SEM, content writing, grouping and regrouping of words. One of the most wanted skills on Elance and Indeed is knowledge of WordPress which took me in turn to programming and coding. Where will the Internet take us? CJ Aunt Jarmilka’s desserts. Post Holiday sweet dreams. Newsletters scale well on all your devices. EW This WordPress.com site is about Emma's Writings. I track the events and stories that have led up to my penning of the family immigration saga "Greenwich Meridian where East meets West" on this site. I also plan to write a screenplay based on the memoir. I firmly believe in turning a piece of literature into a motion picture for all to enjoy. My kindle ebook Shifting Sands Short Stories is free today and tomorrow only on Amazon. Go to https://www.amazon.com/Emma-Palova/e/B0711XJ6GY. Reviews are greatly appreciated. All you need is the kindle app from Google play store or Apple app store to download and read. On board the Fireball in Munising. Emma's book available @KDL Cascade and Kentwood branches. Ella's Coffee & Cuisine is located at 307 E. Main in downtown Lowell. Fallasburg Covered Bridge is the only remaining functional covered bridge. Cherry Creek Elementary is one of four elementary schools in the Lowell Area School system. Franciscan Life Process Center, home to music therapy and visual programs. Read about 27 Years in the USA. It is the story of the Konecny immigration saga from Czechoslovakia. No part of the Emma’s Writing (EW) blog content may be reproduced in any form without permission in writing from the author.